Heads up. Oakland glass pipe art show “For Tobacco Use Only” opens for one day Oct. 8th, at a private home in Oakland. They're taking submissions through Sept. 25, but the bar is set pretty high. “It's the cutting edge of glass art and hardly anyone has heard about it,” says a press release from show promoter “Ginger ELA”. “Fantastical figures sprouting curling horns, meticulously detailed color schemes, the elegant and the grotesque—these works represent the highest levels of glass mastery, although for their carefully placed holes they are persecuted as paraphernalia....As the lowbrow art movement gains momentum, the focus has been on cartoonists, graffiti and tattoo artists. The annual "For Tobacco Use Only" exhibition seeks to bring public recognition to the street art equivalent from the glass world." 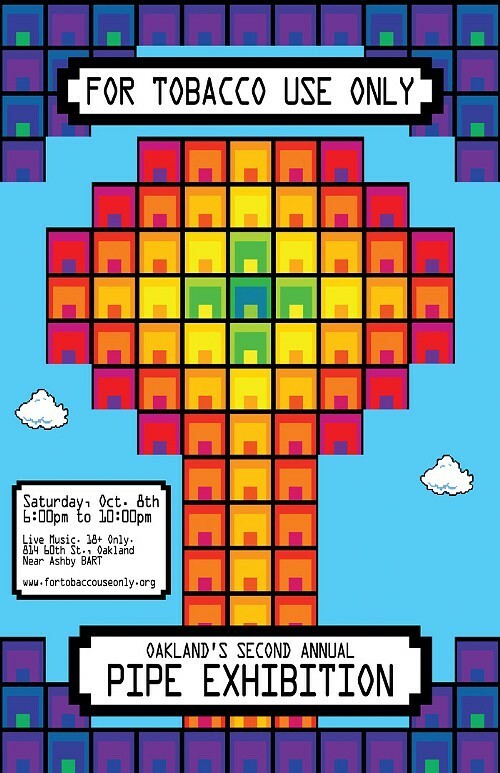 “For Tobacco Use Only” is Saturday, October 8, from 6 to 10 p.m. at 814 60th St. Oakland, California. Check out the web site for entry details. Pictures and video after the jump. “In today's economy most industries struggle to survive. Yet the art pipe scene flourishes. Nationwide, new headshops and glass pipe galleries are opening every week. Also known as 'headies' or 'headpieces,' works from respected artists fetch prices upwards of $40,000. Even as new glassblowers flock to the craft, there aren't enough hands to meet the growing demand. Enter Oakland, already renowned for its favorable laws and as the home base for the country's industrial arts. Against this backdrop you would expect to find a thriving community of pipe artists, yet the local scene has been nearly nonexistent—until now. At the edge of town, a handful of artists are leading the way.With torches flaring and fans humming, these artists signal the first sprout of Oakland's own heady glass scene. Known as Ginger ELA (formerly Zingiber), Koji, and Umbsstadder, they have come together in true Oakland style, pulling together the local pipe scene by its bootstraps. They eschew the traditional secrecy of glass art, sharing and advancing such techniques as the fillacello and reversal. They explore the landscape of styles, from carvings of alien fantasy to recreations of popular icons. They will present the modern stylings of high end glass pipe art, including creature sculpture, meticulous line work, and detailed color schemes. There will be both dry and water pieces, the artistic to the scientific, from slides to percolated tubes. All pieces are made with borosilicate glass, commonly known as Pyrex. Attendees must be 18 years of age or older. Oakland's heady glass artists are gaining recognition across the United States. Glass Aficionado magazine published Ginger ELA's work under the handle Zingiber, and she competed in several high profile shows, including the 2011 Degenerate Flame Off in Eugene, Oregon. Their works have been recognized by several online communities, including a review by Kulture in Richmond, Virginia and have been featured on www.glasspipes.org. They come from California's Central Valley, the SF Bay Area (South and East), and Pennsylvania respectively. And just so no one feels left out: shout-out to The Crucible.